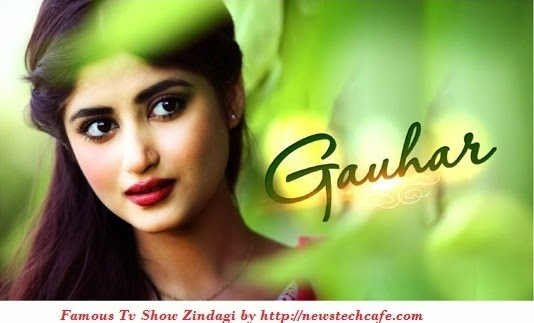 "Gauhar "is Famous Tv show Running currently on Zindagi tv .Gohar is a Zindagi serial starring Sajal Ali and Ahsan Khan is lead roles along with Taqi Ahmed and Asma Abbas. The show was broadcast in India on Zindagi, airing from 17 December 2014 to 10 January 2015, under the title "Gauhar". In Pakistan this show is broadcasting with the name of Gohar-e-Nayab in 2013. Gauhar is a story of a young beautiful orphan girl who lives with her maternal family. She gets treated like the servant but Gauhar does not let it bog her down. She has an exceptional spirit and she gets back with her innocent ways. A stranger in a strange world, motherless and selfless, Gauhar fails to find her space in this selfish world. Exploited in the guise of care and cheated in love, her chance marriage with a handsome and well-to-do Sami who is her cousin turns out to be a plot for revenge. The only people who truly care for her are her grandmother & maternal Uncle. A matchless struggle of a gem of a woman named Gauhar-e-Nayab aka Gauhar! Gauhar is indeed special. She has dreams and hopes for a fairy tale ending. Will Gauhar's dreams get realised?